True story: St. Louis-born in a decidedly un-foodie time, I did not know that provel and provolone were two different cheeses until after I had moved to California and was married with a baby. Really. I had a sudden taste for one of those delicious house salads we used to get from Talayna’s back when there was only one enormous and dirty location in DeBaliviere, before it got all prettied up and moved. 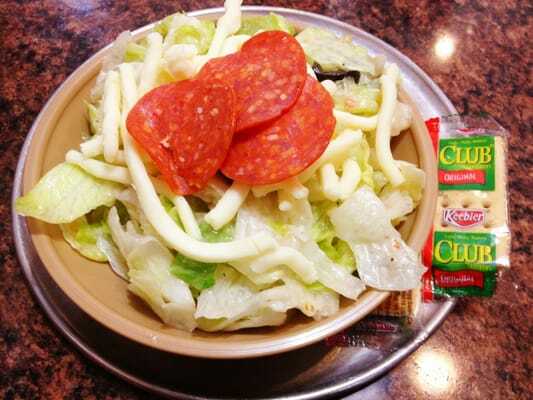 The salad was an enormous mound of iceberg lettuce with a few Greek olives, cherry tomatoes, croutons, and delicious gooey tubes of provel cheese, all tossed together with the house dressing, a garlicky creamy Italian that my BFF assured me her mother said was very close to Marie’s. I made the salad that night with provolone and was disappointed. Where was that soft, gooey cheese I craved? I confessed to LL being confused that the provolone in California was so – different from my midwestern cheese. “But we called it provel,” I reasoned. “Maybe there’s some difference.” And that’s when I learned they’re two completely different cheeses. “Provel is like Velveeta,” he informed me. It’s processed. It’s not even cheese. I’ve never seen it around here.” To this day, I have no idea how my native California-husband knew about provel 22 years ago when just 2 years ago even Anthony Bourdain hadn’t. He just knows things, it’s his superpower. So I moved on and found other cheeses, and for all these years provel was just something I have once a year when I manage to sneak in an Imo’s pizza on visits to my family. Then this past spring I found this nice piece in CNN’s Eatocracy called Hungry for Home: Provel cheese with an actual recipe for homemade provel. This is a homemade version of the gooey processed white cheese popular in St. Louis. Mix well to incorporate liquid smoke. You know I had to make it. I was suspicious of the added liquid smoke, though. This could be the make-it-or-break-it ingredient. I bought this Lazy Kettle brand Hickory Liquid Smoke that claims to be all natural with no artificial flavors, colors, or preservatives. It smells very strong, and so I used only 4 drops instead of the full teaspoon the recipe calls for. Then I melted the cheeses together, chilled, and grated it again just because I’m sometimes ridiculous. I made the cheese, and it was good. I knew it was good because I hadn’t told anyone what I made, and Kid One, a yearly Imo’s Pizza veteran, took a big bite of a provel-and-mozzarella topped pizza with bacon, sliced tomatoes, and garden greens. He face turned thoughtful, he took another bite and chewed more slowly, then asked, “What is this? It tastes familiar.” Yes. I love it that my son and I share childhood food memories from different places in time. Provel cheese is a St. Louis cultural icon with a sticky history. Blogger Andrew Mark Veety wrote this very well-researched piece complete with oral histories. Fascinating. Provel, as it turns out, makes excellent ingredient in mac and cheese, topped with Italian-style breadcrumbs and crispy prosciutto. It’s now a Kid Two favorite. I’m based in the UK and am passionate about making cheese at home (which is why I created a free book on the subject at http://www.homemadecheese.org) but I’d never heard of provel cheese! A really interesting article – I think I’m going to try your recipe. Hi Jack, I would love to know what you thought about the provel. I am looking forward to browsing your book – I’m new to cheese making but find my enthusiasm makes pretty good cheese no matter what. The provel is really a mashup so is different, but the flavor is certainly unique. Thanks for visiting and writing. Provel is at the heart of a “St. Louis style pizza” thin crust, generally cut into square shapes. Good stuff. This recipe is no where close to real Provel cheese. I apologize, but the consistency is completely off and it doesn’t melt the same. The taste provides a minor Provel undertone, but it’s still not even close! I lived in St Louis for two years and absolutely fell in love with Imo’s. I’m quite the foodie, and tried to replicate it in 96, with no luck. Wanted to try again tonight, and there you were. Thanks. read your recipe with great interest since we are transplanted from st. Louis to southern Kansas with no imos close. have it everytime we go to my moms in springfield or my brother in law’s in Elsberry. my suggestion(which I will try as well) is to change out the cheddar, swiss and smoke flavoring and instead, use hoffmans smoky swiss/cheddar cheese. I am able to purchase it from the walmart supercenter deli. it is a processed blend and it is excellent and I believe that if I get it as a chunk then shred it together with the provelone, maybe heat it a little afterwards to meld it together, then chill and shred again, I will have the closest thing I can get til I get to st Louis again to buy the provel rope from the sam’s club or find vivianos store and buy a 5 lb block. I have from St. Louis and LOVE provel cheese. Do you melt the 3 cheeses together and then reharden in fridge? I have never combined cheeses together to make 1 cheese so I’m not sure what the process is. THANK YOU THANK YOU THANK YOU! I am a native St. Louisan living in Houston and I miss the provel cheese! You need to tell your husband that Provel is NOTHING like Velveeta because unlike Velveeta, Provel is actually real cheese. Provel is three cheeses blended together to make what can legally be called “processed cheese”. Velveeta can’t use that label because there is no actual cheese in it. It contains nothing but dairy byproducts blended and formed in a way to resemble cheese, but is not aged with bacteria like real cheese is. Oh, BTW, I worked in a pizzeria kitchen for a while and what we would do to blend the cheeses for the pizza is to quarter the blocks of cheese than feed mixed quarters from the different blocks through the mechanical cheese shredder together to get a good mix of the different cheeses we used which fell into plastic bins to be sprinkled on top of the pizza crusts when they were ready to go into the oven. I’ve told him, Joe! At least my kids love it as much as I do. Thanks for your comments; very interesting! How exactly did you ‘melt the cheeses together’? I was born and raised in St. Louis and I used to work at a pizza joint that used the Provel cheese. It was awesome. Now, whenever I go back I stop at Costco and buy about 20 lbs of it at a time and bring it back and freeze it. That lasts me a while – but it would be nice to be able to make it myself. Ed, I just grated the cheeses together in a bowl, microwaved it, and stirred often. Amazon sells it in 2.5 lb blocks as well as in individually wrapped snack sized thingies. I’m so excited to try this on homemade pizza tonight! I don’t have the liquid smoke, so we’ll see how it goes. St. Louis raised, living in Wisconsin. Totally going to do this and thanks. BTW: When you say you “grated it again”, what do you mean? Good question Bob; I grated the cheeses to melt together, then I grated the melted mixture to sprinkle on pizza.